BAYADA hires clinicians who are connected to purpose and who Love What They Do because it is their calling—and goes to great lengths to recognize and reward that commitment, with nearly a dozen employee recognition programs providing scholarships, incentives and perks. As the first home care provider to offer nurses the opportunity to practice their skills in a clinical simulation lab, BAYADA also helps to foster employees’ individual growth with a variety of training and educational programs including nurse residency programs, specialization and certifications. In addition to investing in employees through competitive salary and tailored career progression, the company also supports clinicians with workflow-streaming technology such as tablets, electronic documentation and telehealth communications. 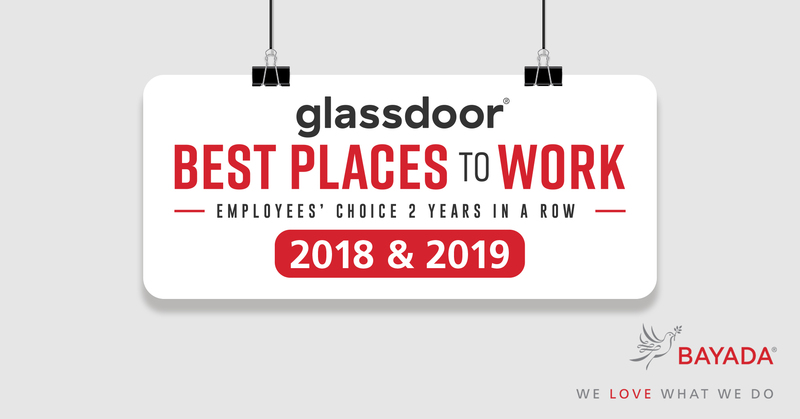 The company’s Glassdoor honor comes on the heels of BAYADA Founder and Chairman Mark Baiada’s Thanksgiving-week surprise announcement that he is distributing $20 million of his personal funds to his employees as part of a “Gift of Gratitude,” a tangible gesture that represents the company’s truly unique culture. This announcement comes as Mark Baiada is finalizing the company’s transition to a nonprofit entity, believed to be the first of its kind in the home health care industry. The move to nonprofit is designed to ensure that the important work of the organization—guided by The BAYADA Way™ vision and core values of compassion, excellence, and reliability—will continue for generations to come, and that good people who are called to a higher level of serving will always have a place of value at BAYADA.